Sunny September Saturday in Uzhhorod park was crowded because of the celebration of the Forest Day. Recently, due to the NGOs´ efforts and flexibility of foresters this Holiday became more open and friendly for public. Increase of number of families and kids, followed by various attractions for them, was observed. For European Wilderness Society participation in this event was an opportunity to meet old friends and partners, and also strengthen cooperation with new one. 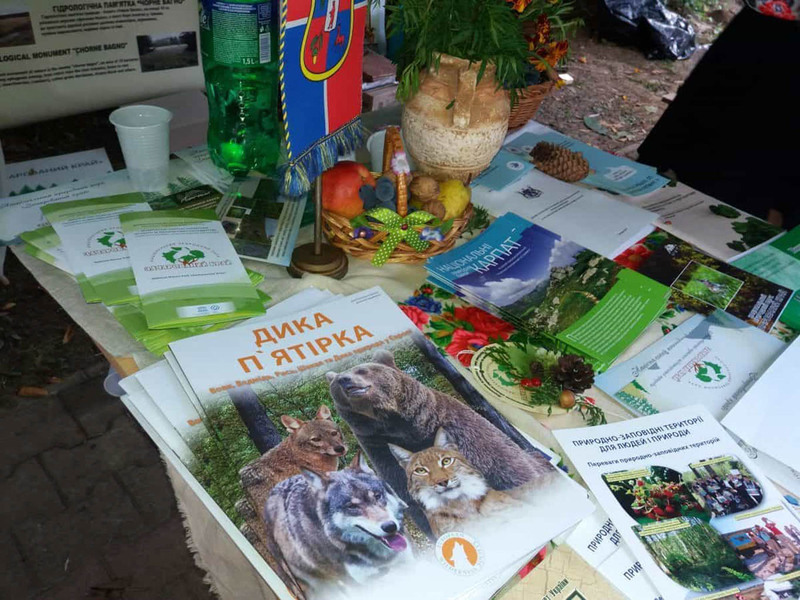 National Nature Park Zacharovanyy kray, National Nature Park Skolivsky Beskydy and also Galyckyy National Nature Park –nature treasures of the Carpathian Ukraine with rich biodiversity, representatives participated in the event. Booth of Zacharovanyy kray with friendly park employees was always full of visitors. They could learn about the park, its inhabitants and activities. Young visitors participated in various quests and got interesting and hand-made prizes. It was a pleasure to see, how the European Wilderness Society´ educational journal Wild 5 was disappearing from the table and attracted attention of the readers of different age!